Hibernian are capable of finishing in the Premiership's top three, says former captain Ian Murray. Following a three-year absence, Hibs sit fourth after 17 games on their return to the top flight - three points behind Rangers and Aberdeen. Rangers visit Easter Road on Wednesday and Hibs go to Pittodrie on Saturday. "They've equipped themselves excellently and Neil Lennon has shown what a good manager he is," Murray told BBC Scotland. "It's been a fantastic start back in the top league and the players deserve a tremendous amount of credit. It's very difficult to adapt and up your game in a different league. "They are getting a lot of plaudits and media coverage, so teams are out to get them a bit. "Hibs certainly have the capability to finish top three, there's no question about that. "If they're outside the top four, people will be a bit disappointed. That's the pressure they are under now, with expectation levels." Last season's Championship winners have lost just three league matches, all at Easter Road. Lennon's men appeared to be heading for a fourth home loss on Sunday before coming from 2-0 down to draw with Celtic; the second time they have shared that scoreline with the champions this term. 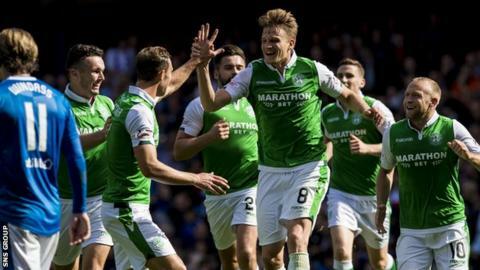 Hibs beat 10-man Rangers 3-2 at Ibrox in August, a third consecutive victory in the fixture by the same margin, including the 2016 Scottish Cup final. "It doesn't matter how you win, both teams will take a 1-0 right now and they won't care how they get the goal," said Murray, 36, who spent two seasons with Rangers in between two spells with the Edinburgh side. "But if we get a game that resembles what we've seen on the last few occasions, then the neutrals would love to see that. "I expect it to be tight but Hibs, under Lennon, are used to the big occasions and home advantage might see them through."